What an awesome weekend. It's the first full weekend that my husband and I were both off for and what a great time we had. 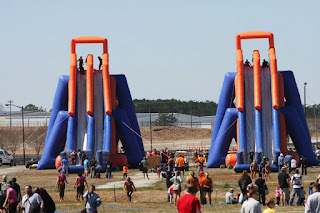 Let me start by saying, I am not a fan of obstacle races, I only do them because my husband loves them and I love doing ANYTHING with my honey! I was a little scared of this race as my quad has still been acting up from last weeks 10K. I ran on Thursday evening and it did not feel good and I thought for sure I was sitting out the race. I rolled like a mad woman Thursday evening and Friday and took it easy Friday getting ready for the BIG race. Saturday morning rolled around and I felt good. We traveled for an hour to get there and I think I massaged my leg the entire trip, I have a bruise on my quad to show for it. When we got there I came face-to-face with my greatest fear. I have a fear of heights. All I saw was a wet, slippery climb to the top of this slide and then straight down into a pond of muddy, foamy water. It's close to the finish so we got to check it out prior to the start. The course was nice, started out running on a trail and then immediately hit a mud pond. No worries, a racer before me told me to stick to the sides as there were big holes in the middle. I won't go through every obstacle but there were the normals: mud pits, climbing walls, cargo net climbs but here's where it gets fun. There were two slip and slides covered in foam, a bounce house covered in foam, and the wonderful slide. I felt my quad start to tighten, I stretched and it was good. I ran the entire course and even did the slide. My husband climbed up beside me and went down with me. The actual slide part was great!!! All in all, for an obstacle race it was great. 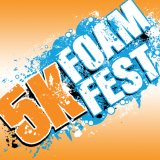 Some of the foam obstacles were not functioning which slowed the course down and as we were leaving another obstacle was deflating. I'm super glad we got there early and got to do all of them and before the rain came in. I told my husband, that was it for me. 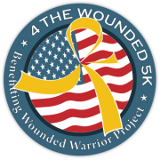 I have a fear of getting injured on these types of courses and don't want to put my other races in jeopardy I have one more race the first weekend in June, 4 the wounded 5K, in Charlottesville which is an uphill course that always proves to be tough. After that, a week or two off and then training for a possible half in August. Mother's Day was great, relaxing and doing some much needed housework to get this place ready for the summer. I got a beautiful bracelet from my husband and children and got to sleep in after an evening out filled with shopping, dinner and drinks. Great weekend spent with all my favorite people!!! To be honest, this sounds like a blast! But like you, I'm fearful of injuries so I have avoided obstacle races so far. But one day I'd like to do one:) Glad you had a great Mothers Day! Thanks for linking up! I'm afraid of heights but that sounds like a BLAST!